Toner Machining Technologies (TMT) is continuing to expand. Owner and President of TMT, Jim Toner, says that year-to-date they have more then tripled last year's sales and with three months to go. "This should be a very good year for us," Mr. Toner said. "Part of our success has been our willingness to expand and invest in our manufacturing, quality and design departments even in these tough economic times." TMT recently purchased a Kuraki CNC boring mill and several other pieces of CNC milling and turning equipment for the manufacturing department. The TMT Quality Department just completed a state-of-art environmentally controlled QC lab and equipped it with a Zeiss Eclipse 1000 DCC/CMM and a Brown & Sharpe Gage 2000 CMM along with several other new pieces of inspection equipment to expand this department's capabilities. The Design Department was recently renovated and added Solid Works and Cosmos finite element analysis software for customers who prefer 3-D solid models. The company designers also utilize AutoCAD 2000 for design projects. Jim Toner said, "I feel this kind of reinvestment will pay big dividends for us in the future, as the economy starts rolling again." 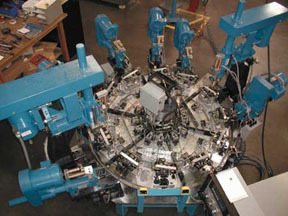 TMT designs and builds workholding fixtures for CNC equipment as well as complete turnkey projects. They also design and build gages and special machines. The company recently completed a 12-station dial machine for one customer and five inline gaging systems complete with three lasers and five vision system inspection cameras per machine for General Electric. Toner Machining Technology also does contract machining, production machining and product development for companies such as Caterpillar, Dana, GE, Arvin Meritor, Getrag and others. In June of this year TMT was voted as one of the fastest growing top 100 companies in America by Entrepreneur magazine and Dun & Bradstreet.